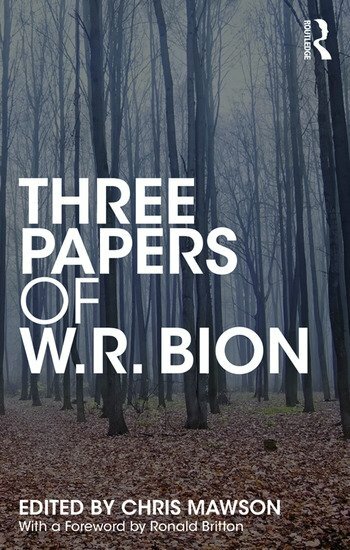 Three Papers of W.R. Bion features two previously unpublished papers and one which has only previously appeared in The Complete Works of W. R. Bion (2014). Characterised by Bion’s directness, clarity and intensity, together they illustrate important aspects of his later thinking. They also show Bion using his key ideas in fresh contexts which will allow readers already familiar with his theoretical and clinical concepts to appreciate them from a new angle. The first paper, Memory and Desire, clarifies one of Bion’s most important and clinically-relevant ideas: the value of suspending elements of our memory and desire in the service of allowing openness to psychoanalytic intuition. The second, Negative Capability, was reformulated to become the final chapter of his 1970 Attention and Interpretation. The publication here of the original paper allows an interesting and rewarding three-way comparison to be made with the 1970 chapter, and Memory and Desire. The third paper, Break Up, Break Down, Break Through, was presented without notes in 1976 in Los Angeles and the transcript from the recorded talk is published here for the first time. It displays the complex interweaving of the personal and the theoretical and offers a fascinating contribution to the study of what Bion called "the turbulence that obeys no man-made ‘laws of nature’". Wilfred R. Bion’s writing continues to be read and re-read by an increasing and widening readership; the three papers presented here possess contemporary clinical relevance and each have a bearing on the underlying philosophical basis of psychoanalytical work and thinking. Chris Mawson is a training and supervising analyst of the British Psychoanalytical Society and works in private practice as a psychoanalyst. He is Editor of The Complete Works of W. R. Bion (2014), alongside Consulting Editor Francesca Bion.